Monthly education meetings have been suggested as a way to increase member interest and to introduce potential candidates to the lodge, as well as to provide masonic education. Monthly education meetings are a great idea, but only if they do not add an extra meeting to an already full schedule. Another way to do this is to set up the same day of the week every week of the month as a lodge night; this would also be the same night that the business meeting would occur. The week following the business meeting would be an initiation, the next week a passing and the third week a raising, with this order subject to some change for special needs of the lodge or candidates. Any week that would be without work would be announced at the business meeting as an education night with a festive board for masons or for visitors depending on the subject. For lodges meeting on the second week of the month, this schedule would be altered to fit. Also, Scottish Rite and York Rite meetings could be incorporated into the schedule if they fall on a "lodge" night. I can only tell you that my lodge does not seem to have any of the problems that [some lodges are] facing. We have degrees, often multiple degrees, three weeks out of four (the fourth being our stated meeting/dinner) except the months we are dark. This month we are initiating 9 new members with several others waiting in the wings. That is three EAs each of the last three weeks in July including three tomorrow night. Our lodge does a number of things that are fairly unique. First, our coaches insist that the brothers come to lodge for coaching at the same time the meetings are held - the coaching is done in the library. That way the EAs and FCs meet everyone and get a sense of brotherhood. The EA or FCs are invited to stay at lodge (and come into the degree if allowed) and have cake/pie and coffee after the degree with everyone else. Second, our trestleboard comes out every month. Even if there was nothing happening it would still come out every month. The editor, Worshipful Ralph Dash passes out event cards to everyone at our stated meeting and asks that everyone fill them out claiming that everyone has something to share with the lodge. These events - weddings, confirmations, bar mitzvahs etc. are printed in the trestleboard. They go a long way toward bringing people together. At meetings our officers know that they are responsible to greet everyone and make visitors feel welcome. Last month we had two visiting brothers from Scotland. One was so impressed with the number of people and the comraderie that he came back the next week to watch a third degree - the seventh third degree of the year. This year we will do more than 30 degrees and our stated meetings often have between 150 and 200 persons. Also we have a program for the wives at each of our stated meetings. Finally, we have a large number of events: This year we have had trips to the Ramona pageant, Barona Casino, San Antonio Winery, a picnic, a St. Patrick's Day dinner, an ice cream social etc. I hope that some of these ideas might help your lodge. Just last year (1999) M:W: Brother George Adams, PGM of the Grand Lodge of the District of Columbia, published "A Trilogy: Inner Journey to the East, Meditations of a Master Mason Along the Way, and Masonry for the Millenium." The third of these three books, bound in one cover, includes a ten-point "recipe," if you will, for a "new old-style lodge" that captures the essense of the 18th century lodge. 1) The Lodge has quarterly dinners following its stated meeting. 2) The Regular meetings of the Lodge and the dinners are looked upon as special events, and every attempt is made to make them special. 4) Business meetings are streamlined and kept to one hour maximum. Potential lengthy discussions are cut short by the Master who either calls for a vote or sends the issue back to committee for further study and recommendations. 5) Meetings are followed by a traditional festive board around a U-shaped table, with the Master at the head table and the two wardens at the ends of the two legs. The brethren gather for drinks as soon after the close of the meeting as possible and then go to the table when the Junior Warden rings the dinner bell. A formal toast list is not required as this is not a "Table Lodge." A festive board is a more relaxed manner of having the Lodge gather for a dinner presided over by the Master and Wardens, without the rigid adherence to traditional rituals and toasts. The Master may entertain or request whatever toasts he chooses. 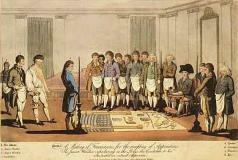 6) Dinner is followed by a 20 minute program on some aspect of Masonic history, symbolism or philosophy. The program must be about Freemasonry. 7) Degree fees and dues should be in keeping with the times in which we live rather than what they were in the late 1930's or 40's. In one case, the EA fee is $250, the FC is $150, and MM is $100. 8) Excellence in degree work is most important. No degree is to be conferred, and no member of a degree team is to participate, without the Lodge conducting a complete degree rehearsal with all participants present, within a week prior to the conferral. 9) The Lodge should conduct at least two additional functions during the year to add deeper dimensions to the social aspects of membership. These should be purely social and might include a dinner-dance, or a Lodge picnic, where members can bring their wives and girlfriends. 10) One cardinal rule that the Lodge must always observe is that it must make a clear distinction between Masonic functions and social functions. Ladies and non-members are never to be invited to Masonic functions where Masonic business is conducted, Masonic topics are discussed, or Masonic addresses are given (Installations of officers, Lodge coffees, Lodge festive boards and table lodges, Masonic Lectures, etc.). By the same token, when the ladies and non-members are included in Holiday dinners, dinner-dances, Lodge picnics, etc., no Masonic business is to be discussed, no Masonic topics are to be discussed, and no Masonic speeches are to be given. Masons enjoy Masonic fellowship without the non-members present just as much as they enjoy social events where the non-members are present. They should not be denied the enjoyment of either type of function. By the same token, Ladies and non-members generally do not look forward to attending Masonic events where the business, symbolism, and philosophy of a fraternity they cannot join or fully comprehend are conducted and discussed. This is the one rule that has met with the greatest greatful approval of the ladies who have been made aware of it. Sorry, I don't know the price of it. Once again, if you have a lodge that is going fine without these changes, GREAT! We want to hear from you and, perhaps to include your ideas in our next revision. Please contact the website editor by clicking HERE.